The images that were taken down are part of a series of 51 photographs by Yafang Shi called Marching for Gender Equality: Voices, Movement and Empowerment, which are on display at the Markham Village Branch until March 30. The Markham Public Library is apologizing for removing three photos from a photography exhibit on women’s marches because they contained objectionable language. The decision came after Yafang Shi, the photographer behind the exhibit, vowed to defend the right to freedom of expression and the ability to use the public library as a space for diverse views. 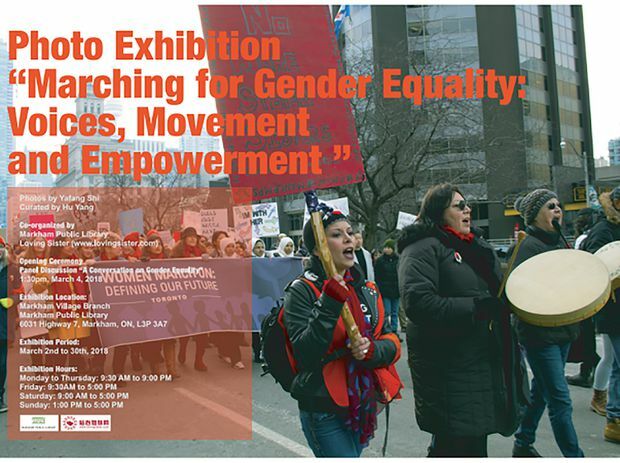 The images are part of a series of 51 photographs by Ms. Shi called Marching for Gender Equality: Voices, Movement and Empowerment, which are on display at the Markham Village Branch until March 30. The prints were removed by the library on March 2, which was the first day of the show. They were put up again for a panel discussion on gender equality two days later and immediately taken down once it was over. Ms. Macklin said staff took the photographs down after receiving several complaints from community members. Those who complained said they found the pictures offensive and were worried about their children being exposed to them, she said. “The community feels that they can reach out, and they feel a sense of ownership over the library and the collections, the exhibits, and so on, that are in the space,” Ms. Macklin said. Photos from the art exhibit were taken by Yafang Shi at the Women's March in Toronto. Ms. Shi said she didn’t expect the images to cause negative reactions because she assumed people were aware of the social context of the word. Ms. Shi said she didn’t expect the images to cause such reactions because she assumed people were aware of the social context of the word. “Trump made the comment. That’s why women or people protest,” she said, referring to a comment the U.S. President made before he was elected. She said she believes her camera is the best tool to capture the emotions of those who were saddened and angered by the results of the 2016 U.S. presidential election. “It’s not only about the photos themselves, I would like to bring the dialogue, the conversations [to] the diverse community [in] Markham’s suburban community,” Ms. Shi said. The photographs were returned to the exhibit on March 23 after the library had back-and-forth discussions with Ms. Shi, according to Ben Hendriks, chair of the Markham Public Library Board. Mr. Hendriks said that a staff member at the Markham Village Branch took the actions they thought were necessary to address the complaints at the time and didn’t follow proper library procedure. The board will be addressing this further at the meeting on Monday night to ensure that staff receive a refresher on proper training and avoid this in the future, added Mr. Hendriks. Ms. Shi has also asked to be a part of next month’s board meeting at the library. She would like to discuss how the library can deal with public complaints, she said.